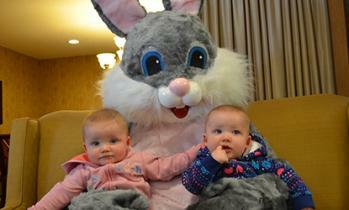 Louisa (pink) and Edith Kosek sat on the Easter Bunny's lap at Grand Meadows Senior Living on Saturday, April 13. Minnesota Secretary of State Steve Simon visited with McLeod County Auditor-Treasurer Connie Kurtzweg on Monday, April 15 at her office to discuss election security. Isabel Petersen struggled to keep the roller ball moving and maintain her balance at Saturday night's post-prom festivities. Winifred Beste-Zhender paints Ethen Parpart's face as Beste-Zhender volunteered her time and artistic ability for face painting. Aerianna Carrigan (left) and her younger sister, Makayla, have grown accustomed to their parents being gone on training assignments as part of their service to the Minnesota Amry National Guard.